I have been admiring this sculpture for a long time because it captures my feelings about certain aspects of corporate life. This creation of cast resin on an iron frame stands on the median strip of Highway 29 in the middle of Charlottesville, VA and towers over passing vehicles. The collection of empty suits stands arrogantly indifferent to the corrosion (faux rust stains) that disfigure their plump, tailored surfaces. From my point of view, the artist has captured the essence of business by the numbers: Empty suits proudly arrayed in close formation while rampant corruption threatens to overtake all. This morning, I finally stopped and took some photos. 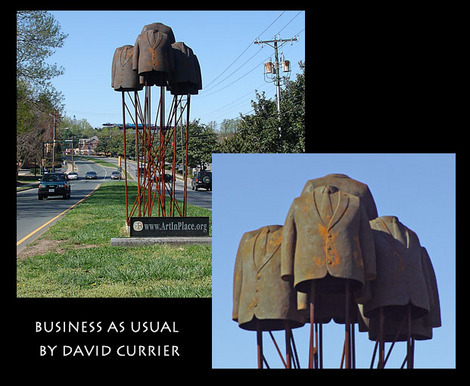 This afternoon, I managed to locate the artist, David Currier, and discovered the title of this work: Business As Usual. David is a 48-year-old sculptor with several major works to his credit. He was cartooning when he left school, did some painting and ended up working for the art foundry Tallix in New York. When his children were small, he moved his family to Charlottesville and began doing sculpture. His works have been displayed by artinplace.org which presents outdoor sculptures that provide the Charlottesville community with a wide range of artistic styles, themes and media to enhance our concepts of space and place and enliven our sense that art has the power to move us. Like many artists, he supports himself by working at whatever keeps income coming in. Currently, this involves working on sculpture enlargements for other artists and by painting houses. I hope to convince him to start blogging, as his work and his ideas deserve a wider audience. For example, he has never worked in a corporation, so his insights come from a study of business as an outsider. I admire the fact that he didn’t create this sculpture as a snap judgment. This is an artist that will attend a symposium at the McIntyre School of Commerce to hear what businessmen and venture capitalists have to say about matters of global concern. I would like to see him create more sculptures for larger audiences. As a start, I am going to ask him to let me use this sculpture on the cover of my next book about corporations. What do you think a book with that cover would contain? Especially if I used a slight variation of his title: Business as Usual? It looks like you are about to write one of them ‘business’ books. hmmm, if they could get it to bellow platitudes and catch phrases for an hourly rate, you could call it a big 3 consulting firm. I would expand the display by adding a woodchipper in front of it that would grind trees into paper documents that are immediately placed into the trash without so much as being read. I think the book might be about the beginning of the end of “the suits” — the self-aggrandized American corporation; the inevitable result of a corporate America that has failed the people; the inexorable result that occurs when an infrastructure crumbles under the weight of its own ego, its own overstatement of value, its own narcissism. The unavoidable result of an entity run amok by greed and little gods. I hope the book will be about the end of an era for worshiping these false gods, and the beginning of an era of self-reliance. P.S. I love that sculpture. He should make it available in smaller desk-sized versions. Maybe a paperweight or bookends.